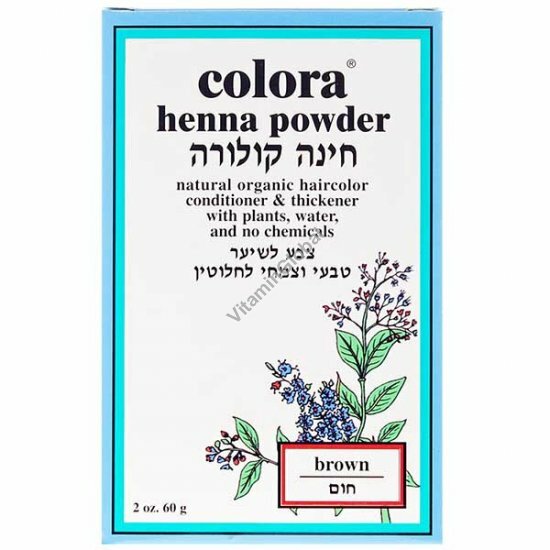 Colora Henna works wonders for your hair, particularly if it feels dull and lifeless. Natural Henna adds body and bounce and offers a choice of rich but subtle color changes. Colora Henna brightens and highlights your hair, leaving it gleaming and elegant. Directions: Shampoo hair and towel dry. In a glass or plastic bowl, mix Colora Henna with water to a thick soupy texture. Apply Colora on hair with a brush, preferably using gloves. Cover with plastic cap and let sit for 1 hour. For richer color leave on hair longer. Rinse and shampoo again. Use of conditioner will help during the rinsing out.